One of the best matches of the day Vega Squadron -vs- Astralis is being played on Inferno where both teams are really good at. Vega started strong as they’ve won pistol round on the back of TonyBlack who made quad kill to secure huge advantage for its team. Astralis managed to strike back with it’s own 3 rounds to equalize the game. Vega tried to turn things around but Astralis just didn’t let them do what they’ve wanted. Danes managed to take control as CT’s and close out the half 11:4. Where Astralis stopped in first half they’ve continued in second. With control over map as T’s they’ve crushed Vegas defense completely and closed the map without lost round. Vega simply wasn’t present on CT side as nothing worked in their favor. 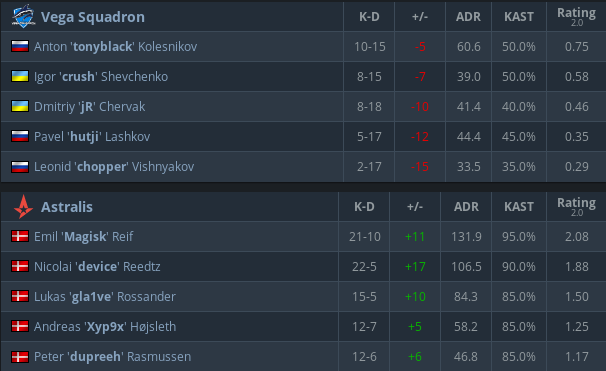 Astralis made 13 consecutive rounds to finish the map 16:4 and are now 2:0 in total. Vega Squadron didn’t show up for their CT side and have now fell to 1:1 score.